SoftPlanet makes it possible for everyone to get free McAfee Stinger Portable download directly from our servers. There is no registration needed for downloading. McAfee Stinger Portable 12.1.0.954 is the portable edition of the popular McAfee Stinger anti-virus software program that scans for and eliminates various threats from your PC. Just like its “parent” software this portable edition is easy to use and figure out and you will not spend much time learning the program. Everything inside is small and intuitive, which is a major plus for this program. In addition just like the name suggests McAfee Stinger Portable is fully portable, which means that it does not require installation and that you can move it around on a USB flash drive. McAfee Stinger Portable 12.1.0.954 has been created for ease of use and portability. 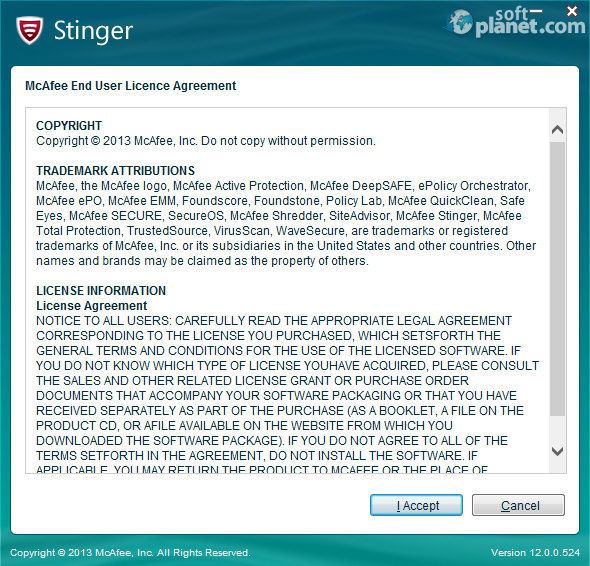 These are the reasons why this program does not require installation, although you may install it if you wish to do so.In addition this version of McAfee Stinger is notable for its ease of use – all you need to do after you start the program is click on the big red button to scan your PC and this is it. Unlike many other anti-virus programs McAfee Stinger Portable 12.1.0.954 is also fast and you won't spend hours waiting on your PC to finish the job. Being a portable program McAfee Stinger Portable does not count on an interface that will try to impress you. Everything has been made simple and clean and this is why this software runs in a square program window where you can scan your PC, quarantine infected files and create log files. In addition you can adjust settings and add more viruses to the threat list that comes along with this software. In case you don't want to scan the entire computer you can choose the drives and folders to scan. Strangely enough we did not see a button or an icon that updates the virus definitions so it's a complete mystery how this happens. McAfee Stinger Portable 12.1.0.954 is very easy to work with – just start the program, accept the licence agreement and then the only thing that you can pretty much do is scan your computer. You can also take a look at the quarantined files, the log files that the app has created and the settings. This is how easy it is to use this program. 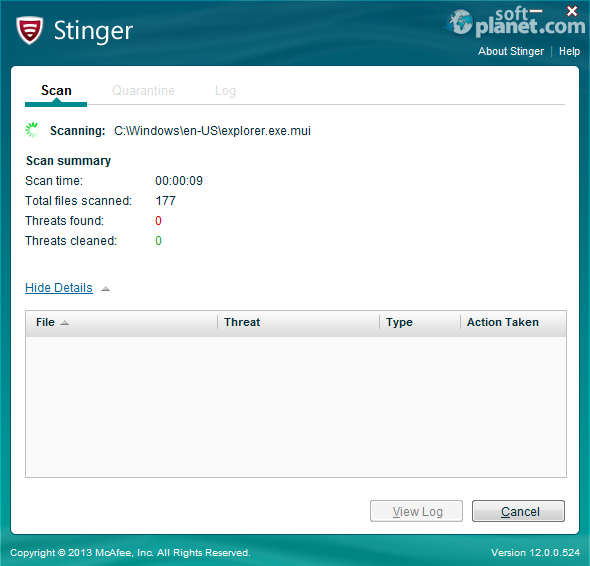 McAfee Stinger Portable 12.1.0.954 is a nice, small application that scans for and detects a large number of viruses. It cannot completely substitute an anti-virus program but it does the job, moreover the app is completely portable, although you may choose to install it. Other good features include fast speed and ease of use. So if you don't want to use bloated and resource-hungry anti-virus apps this one can do just fine. McAfee Stinger Portable is VIRUS-FREE! Our security scan shows that McAfee Stinger Portable is clean from viruses. The current version of McAfee Stinger Portable has been scanned by our system, which contains 46 different anti-virus algorithms. That ensures that McAfee Stinger Portable 12.1.0.954 is 100% safe for your computer.